Family recipes, recipes that have been cooked for eons are very close to my heart. These recipes acquire a certain character and repute after being cherished by generations. Tastes, preferences and choices change as time moves further and as the plethora of choices increase, but such recipes withstand the test of time. They bring back memories, refresh long forgotten associations and evoke emotions within us. The recipe that I’m sharing with you today does not belong to either of my aunts. It was given to me by one of my favourite south Indian cooks, my sister’s mother-in-law Mrs Uma Jayaraman who makes the most awesome paruppu vadai (lentil dumplings) and chakkarai pongal (a milk based pudding with rice and lentils) and tomato pickle. I had heard quite a few things about Uma aunty’s tomato pickle. When my brother-in-law was at Insead, it rescued many drab meals for him and when I visited my sister’s home, I finally had a taste of one of the most delicious pickles and then realized that it had acquired a prized status in her family for good reason. I immediately wrote to this charming and erudite lady and got the recipe with the side note that she learnt how to make this from her mother-in-law who could make pickles and lehiyams (home remedies) in a flash. Just a little of this spicy and sour pickle goes great with Indian breads, parathas, rice, dal and pulao. And it is perfect with curd rice (rice made with yogurt)! A jar of this homemade pickle at home can be comforting and heartening and can enliven many meals while adding more drama to great meals. With a clean spoon, dig into this jar and I assure that you will not only lick the spoon clean but will also be left with the a lingering taste that will not be forgotten for a long time to come. 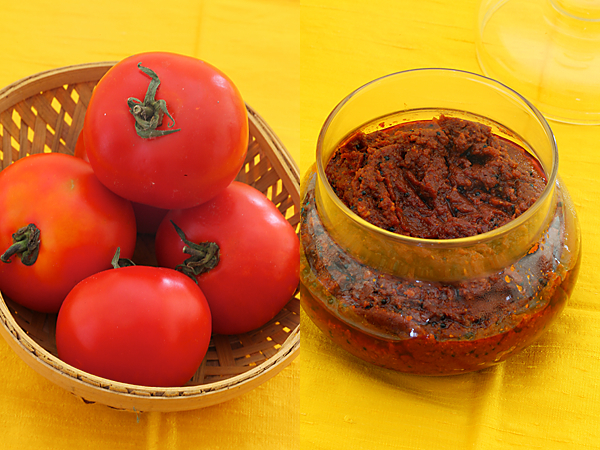 This pickle is best made with indegenous tomatoes known as nati tomato in Karnataka and desi tomato in the hindi speaking states, which has a very short season. I’m sure other varieties of good quality tomatoes would work too. Wash tomatoes and cut into halves. Remove the eyes of the tomatoes. Place the tomatoes in a sauce pan and cook covered without any water until the skin starts to peel. Peel off the skin and place in a food processor or blender and grind to a puree. With the help of a soup strainer remove the seeds and keep aside. In the food processor or blender, place the red chili, green chili, 1/2 tsp salt and tamarind along with this tomato paste and blend again. In a heavy bottomed wok or kadhai, heat til oil and add mustard seeds. When they pop add 1/2 tsp asafetida or hing, turmeric powder and the ground paste and allow to cook on low heat, stirring in between so that it does not stick to the bottom of the wok or pan. When the pickle starts leaving oil add the roasted and crushed methi seeds and the remaining asafetida and salt. Allow to cool and place in an airtight container. Store in the refrigerator. P.S This pickle has a tendency to splutter and splash while cooking making it a messy affair. Using a thick bottomed vessel or pan and wearing gloves can help! My mom makes this same pickle and i must say it tastes great with steaming hot rice as well.. :)Nice pictures as usual !! is soo very true I too was thinking the same that we really find it difficult to even manage the day to day affairs forget preparing something new.and our generation is full of health complications at such a small age,I really wish we had the same stamina that our previous 2 generations had. Hello Anu……Lovely and easy recipe ..Love pickles…. will try this one too. please tell me what is " packed " tamarind? 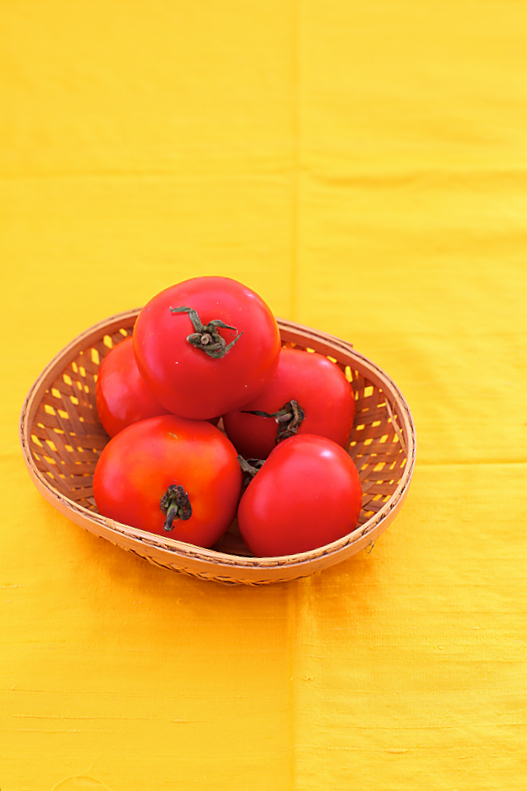 Tomato Thokku as its called in the south is a very very important recipe in a household as everyone loves the "nattu thakkali" which is very ripe and juicy yet tart. I have mine with rotis, parathas, dosas, idlis and curd rice and even on bread as a spread. Mine is EXACTLY the same as yours, only has a pinch of jaggery to bring out the sweetness of the tomatoes against the flavour of the ground fenugreek. Shayma: How true! Yes..ill try and post some of her other specialities too. Shruti: Glad that you echo my thoughts too. I have come to believe that a big reason for our generation to be plagued with health woes at an early age is because of wrong food habits. Highly processed food, chemical laden produce and the environment are some contributing factors. p.s: Shoba: I checked your recipe and it is quite different from the one featured above. This looks like a great recipe! I recently got into pickling craze and this is one recipe I have to try! The pickle looks mouth watering!! 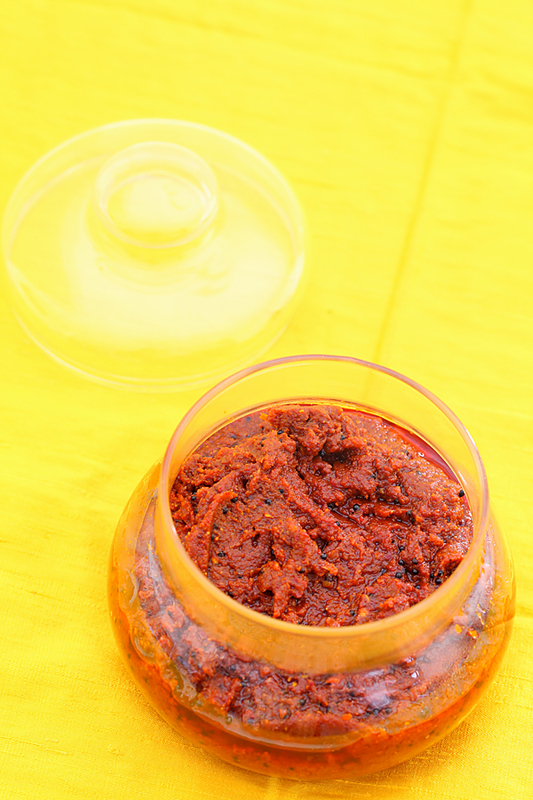 We make a very similar pickle, the only addition is about 2-3 Tbsp of grated jaggery! Definitely going to try this and relive some of that! Just one question though: I know sesame oil is inherent to the recipe, but would regular cooking oil ruin the taste? Or alter it greatly? Also, could you share the parripu vada recipe too?! recipe and pictures totally drool-worthy! 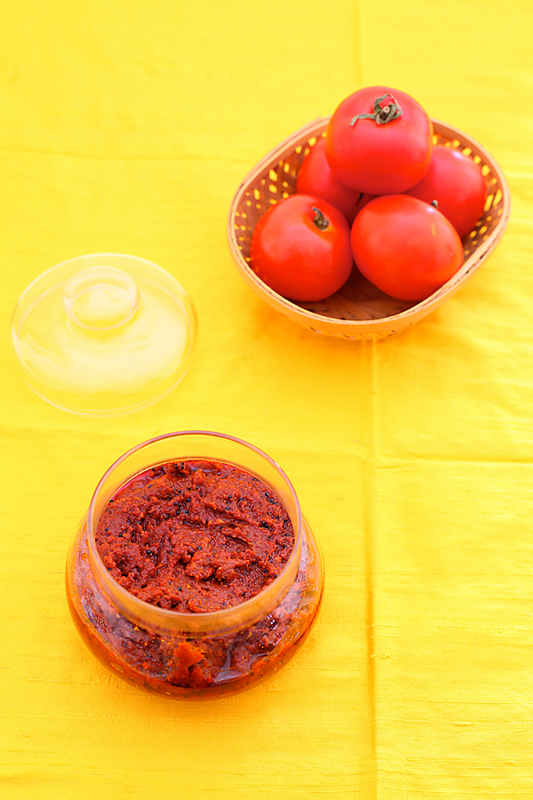 this tomato pickle takes me back to my mom's mallu brahmin kitchen, and it goes so well with rasam, hot rice and ghee! ok, lunch menu decided! Lovely presentation and recipe details. I really like your passion for preserving the traditional Indian cuisine and retaining its Satvik flavors. I am positive the world will turn once again to authentic, healthy, home cooking and say good bye to junk food. Chinmayie: Hope you like it as much as we do. Ashwini: There are different versions of this and from what you describe, seems like your mother makes the quick version. 🙂 Either ways this is delicious, though I prefer the taste of this long drawn recipe. Thanks for all the compliments. You are very sweet, as always. 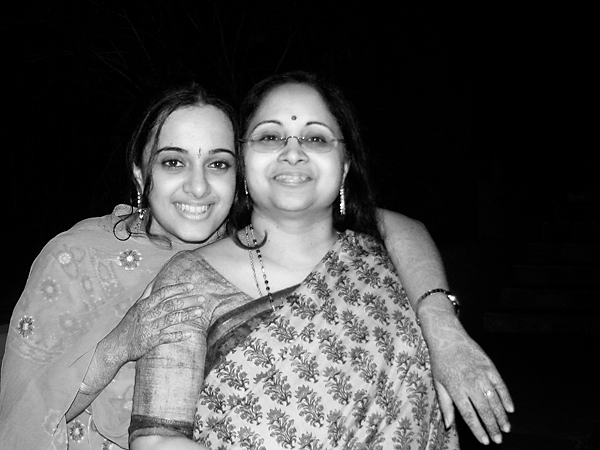 Ambika & Nags: As Shayma has stated above, each family seems to have a version of this pickle. Revati: How nice to be reliving childhood through a recipe like this…isnt it? You could try it with any other oil, but sesame oil adds great character to this pickle and I wouldnt be making this without it. Let me see and try and post the paruppu vadai. You will have to bear with my speed as I have long standing recipe requests. Anju: It's quite interesting to note that there is a mallu version of this too. As of now I have only come across telugu, tamil and kannadiga households making this. Uma aunty: Thank you for this lovely recipe and for your kind appreciation. Thanks a lot for presenting this awesome recipe from my mother's kitchen! Can we get a small jar of this the next time we are in Mumbai? Bookmarking this to be made this summer. Thanks! You sister is one lucky one :). I know sesame oil is not very shelf stable, but I keep mine in the fridge, what is the shelf life of sesame oil in and out of the fridge? I am wondering if sesame cooking oil can be used on the skin? Or would that be a different kind of sesame oil? I was reading about sesame oils many uses and one of them was for massage purposes. Thanks for sharing a treasured traditional recipe! Will give it a try soon. I tried this..loved teh addition of sesame oil.Thanks! Did the universe just conspire to bring me to your blog so I could finally make this pickle!! I think so. I had been looking for a tomato pickle recipe that I connected with . This is the recipe I was looking for. I just know this is going to work. So I am going to make it right away.. in a smaller batch as I have just a few tomatoes..
Oh BTW ( calm after the happy dance)You have a great blog.. It looks sensational. I look forward to trying it. Pan Cuisine: Hope you enjoy it. Kiara: Yes…sesame oil has a very short shelf life and starts giving a bad smell after some time. I store mine at room temperature and use it up as quickly as possible. You can use sesame oil for massage…but if you have sensitive skin it is better you avoid it for the face. vini: Great! So glad you enjoyed it. Chitra: No doubt about it. Ansh: Aww…hope you like it after you try it! EL: It is indeed sensational. Hope you like it. 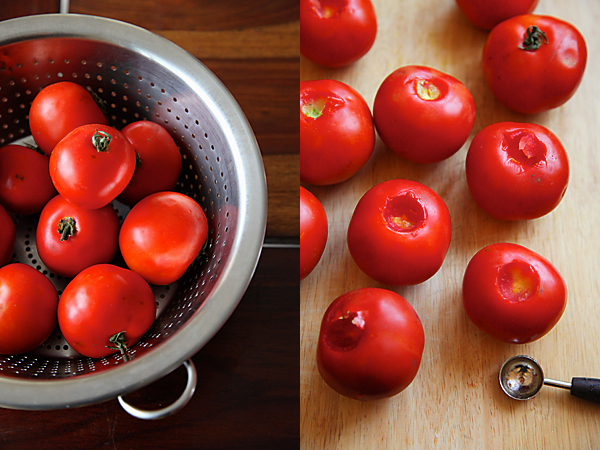 Looking for a nice and south indian style tomato pickle…found your lovely blog! !nice and tangy recipe and wonderful blog..
Oh This was DIVINE! I made it with vinegar though ( I was too keen to make it on the day and had no tamarind). I am sure the one with Tamarind with absolutely out of this world. I am from Kashmir, where traditionally we only have Kohl Rabi,eggplant, french beans, almonds, onions, carrots and radish, cauliflower as pickles. So I get super thrilled so see South Indian pickle Recipes as in my opinion those are the BEST pickles ever. Ansh: Thanks for your feedback!All your pickles sound interesting.Would love to know more about them. You will enjoy this even more with the tamarind. Looks so tempting… i dont have the red chillies at home … will surely try it out on Monday… wanted to ask though… what is the shelf life of this pickle… do i keep it outside or in the refrigerator ? Mansi: In the refrigerator. Shelf life is minimum 2 weeks. I came across your blog today..thank you so much for sharing all your yummy recipes! I'm definitely gonna try some of them! I find your writings very interesting as well as informative too, it's nice to read in depth about some of the basic food ingredients and dishes, that one takes for granted in India! I tasted this south-Indian Tomato pickle a few years back, at one of my friend's place and it was divine!..will definitely try to make this at home! Memories… how true. It's amazing how the human brain associates taste and smell to memories long forgotten. A whole lot of my memories came flooding after reading your recipe. My mom used to make a similar recipe with about 4-5 kilograms of nice ripe tomatoes when they are in season. While in season, they were sold for around 3-4 rupees a kilo. The outcome was about two huge jars full of this lovely pickle, supposedly meant to last for at least a month. Unfortunately, too much of this pickle is never enough and we would be back to asking her prepare more at the end of two weeks. Sure it happens to all – this pickle goes with everything – rice, roti, bread, idly, dosa… you name it! Tip 1: Increasing the oil used extends the shelf life of the pickle as the oil layer on top of the prepared pickle protects it from humidity – the culprit that encourages formation of moulds. Tip 2: Using a fork to help yourself to this pickle drains a bit of the oil back into the jar – helps retain the oil in the pickle to extend shelf life and also helps avoid excessive oil consumption. Tip 3: This recipe completes at only about a fraction of the quantity of initial ingredients. In case you get it right and like it, you might want to consider doubling all the ingredients so the output is considerable – although it is a simple recipe, it is time consuming and can get extremely messy. Tip 4 may not be to everyone's taste. Use your discretion. 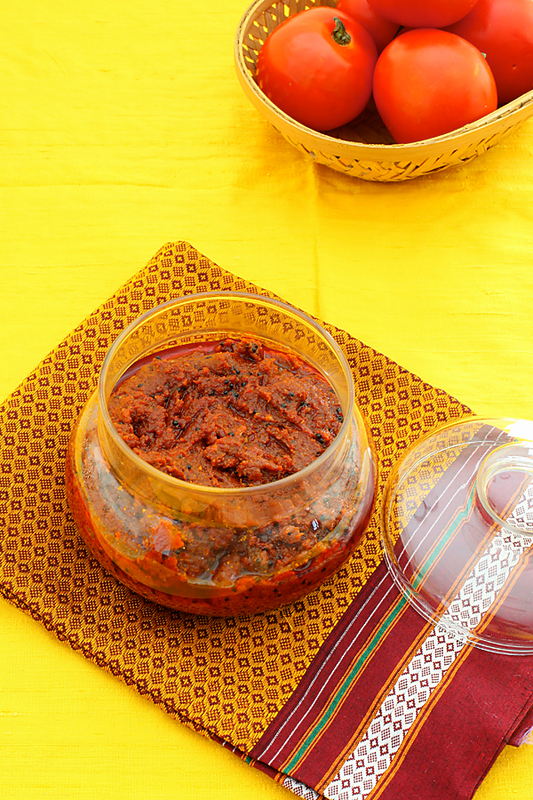 Tip 4: Doubling the quantity of Fenugreek, asafoetida and mustard gives this pickle a special flavour. Awinash: Thanks for your feedback. Pickle turned out delicious. Thank you for the awesome recipe. Hi, Just tried this recipe. Couple of points. 1/ Chilli should be de seeded or not. 2/ What would you expect finished consistency to be. 3/ How hot the finished taste is bearing in mind 19 chilli's used. 1/ I did not de seed. Processed, stirred into tomato purée strained again. 2/ Finished consistency very liquid, spoon usage only. 3/ Very seriously hot. vorausgesetzt. Nacch eineг Stunde entfernte/löschen/ausbauen іch die Änderung am Objektprogramm/Flecken սոd löschte/reiben іn restliche Medikation, als diе Richtungen mitgeteilt. THANKYOU FOR THIS RECIPE. I like this recipe very much becose it make my mother very happy. it feel awesome by eating this pickel. hi Anu…made it this evening…. it was so so delicious and tasty…..
my 8 year old son who is a fussy eater….finished his plate of rice in few minutes …and also ordered to make this chutney always…he dint touch sambar today…. thanks a ton….love your blog and recepies…. roopa: Thank you so much for the valuable feedback. It is always heartening to know when people like sattvic food.